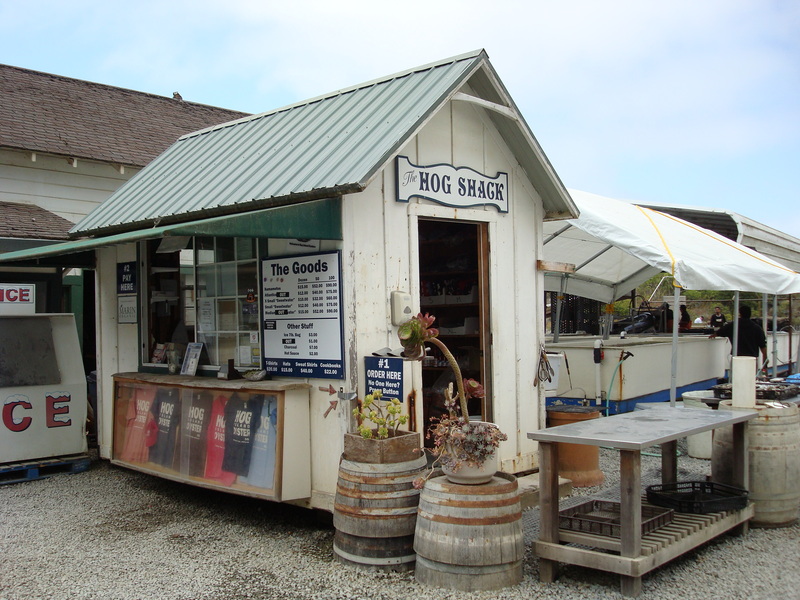 By the time my fellow adventurers and I found the little roadside establishment on the shoreline where we expected to enjoy dozens of oysters, my second mother’s husband Doug had demoted me from trip navigator to map flunky. I had misdirected him at least twice as we drove around the long, winding roads between Highway 101 and the coastline at Bodega Bay. 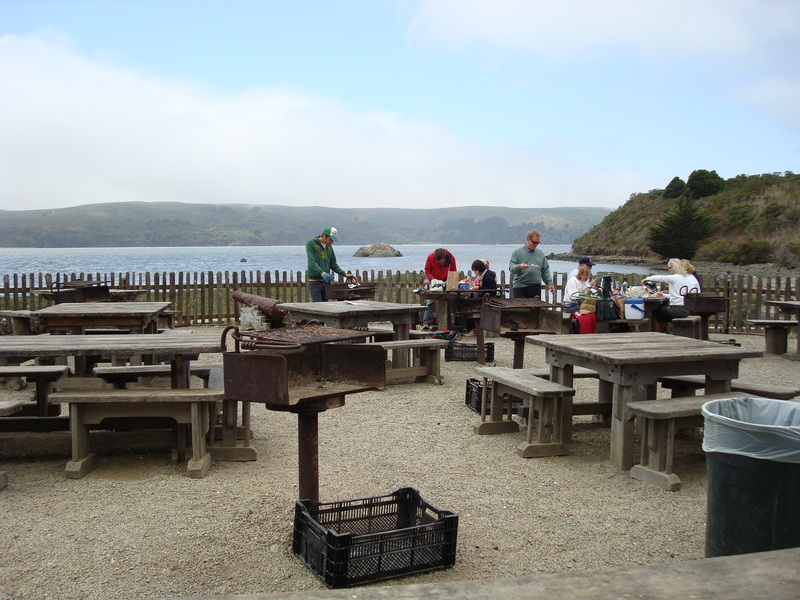 We arrived at the Hog Island shack half an hour late for our appointed picnic time at the rustic wooden tables off to the side of the oyster-sorting area. In spite of being late, only one other couple occupied any of the tables at 12:30. The set-up was simple. We ordered two dozen of Smalls and two dozen of kumamotos. The young guys who operated the picnic operation piled the oysters on a brown plastic cafeteria tray to which a shucker was permanently attached by metal cable. He threw on a thick rubber glove and a few lemon halves. We carried our trays to a table, where we looked out over the inlet to the low horizon created by Point Reyes, shrouded in light clouds. Fortunately, we had brought sweatshirts and sweaters. I shucked and passed the oysters around. We opened a bottle of wine. The Smalls were large, plump, and filled with briny liquor. The kumamotos had an intense sweet flavor but were so small that the shucking effort seemed to outweigh to the end result. Eating oysters in the open air next to salt water must be the ideal form of oyster consumption. Within an hour two other parties showed up. One group got right down to the business of starting a charcoal fire in one of the upright metal grills. The other spread festive red and blue paper tablecloths and napkins on the table. I noticed they poured my favorite prosecco, Sorelle Bronca. The oysters cost around a dollar a piece. The kumamotos a little more. Considering that only three of the six or seven tables were occupied while we were there (12:30 until after 2 pm), I’m surprised I had to reserve a table so many weeks ahead. But it was a Friday and no doubt Saturdays attract a full crowd of shuckers and slurpers. I am jealous that I didn’t get to go!! Maybe we can revisit hog island again in one of the “good oyster months”…those with the letter “r” in them…right?? We’ll definitely book a table for a bunch of us. I’ll work on your mother for date!